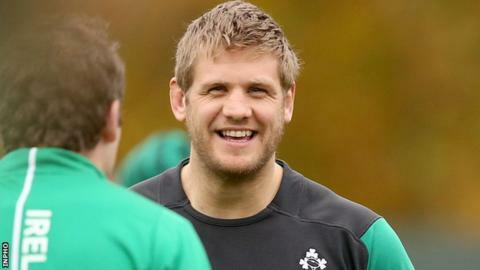 Ireland coach Joe Schmidt hopes Chris Henry can boost his chances of playing in this year's World Cup by returning to action before the end of the season. The Ulster back row had heart surgery in December and will miss Ireland's defence of their Six Nations title. But Schmidt has not dismissed Henry's prospects of playing in the World Cup. "He is going really well. If he can get some involvement with Ulster before the end of the season, that could be a springboard for him to be back in." Schmidt indicated that the 30-year-old flanker had become an integral part of the international set-up. "Chris was one of our unsung heroes last year," added the Ireland coach. "He did a super job in the Six Nations for us and in [the two summer Tests against] Argentina as well. "I would love to have him in the group right now for the Six Nations. "He was listed to start against South Africa when he got ill, and that demonstrates where he was in the pecking order at the time." Henry's Ulster team-mates Paddy Jackson, Stuart Olding (both elbow) and Andrew Trimble are all out injured as Ireland build up to their opening match away to Italy on 7 February. "We could have done without Paddy and Stuart getting those knocks. "With Jonny Sexton missing, Paddy would have been one of those in the reckoning for the match against Italy. "Andrew Trimble was our player of the year last year and we are missing him as well. "We will keep track of all of them and hope they make a positive recovery." Olding and Jackson look like missing the entire Six Nations. Winger Trimble could return during the championship having been sidelined with a toe problem.